Please note: As this cartridge is used in both pistols and rifles, it will be listed in Collectible Single Cartridges, Metric Pistol, Rifle Sections. One Cartridge: 6mm Remington Benchrest by Remington, factory manufactured with new brass with a “R-P 6mmBR REM” Head Stamp and loaded with aa 100 grain JSP (Jacketed Soft Point) projectile. 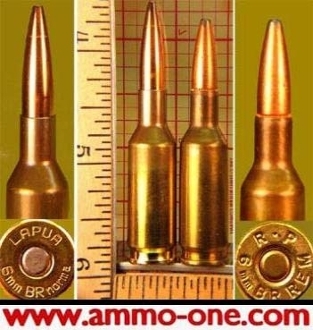 Although these cartridges share the same case dimensions they are considered different calibers due to the different standardized projectile length. Remington introduced the "6mm Benchrest Remington or 6mm BR Remington" in 1988, but the design goes back tothe early 1960s as wildcats were designed by shortening the 308 case and reducing the mouth to accept 6mm projectiles. Remington designed this cartridge as a bench rest cartridge with a 100 grain projectile JSP, for use in Remington XP-100 pistol. The 6mm BR Remington is now obsolete, and no longer factory produced by Remington. Norma introduced the "6mm Norma BR or 6mm Norma Bench Rest" in 1996, and considered it a long range cartridge using a design with a very long 100 grain projectile (very low drag) or (VLD). The 6mm Norma BR is consider a current cartridge, still produced, but hard to find. As Norma's OAL (over all Length) was longer than the 6mm Remington Benchrest, Norma had to standardize the caliber in Europe and introduce it as "6mm Norma BR" as a completely different caliber, or new caliber as it had a longer OAL (over all length) than the 6mm Remington Benchrest, even if the cases were the same dimensions. Confused? I know - sometimes it doesn't make sense, basically (I feel) Norma stole the case design from Remington, and put a longer projectile in the case.. My opinion only.